I fancied something different this week, so ventured to a local day ticket water less than an hour from home, where catfish were my target… Home Farm Fisheries in Alsager have a couple of pools, but it was the specimen lake which piqued my interest having noted a few cats on the bank during the preceding week or so, and as I haven’t caught one for a while, I thought I’d try my luck, and booked my peg for the following day. I arrived bright and early, returning to the fishery for the first time in a few years, and quickly remembered that it was from Home Farm I caught my first ever cat, a slippery customer of 17lb 14oz, whilst fishing for carp. 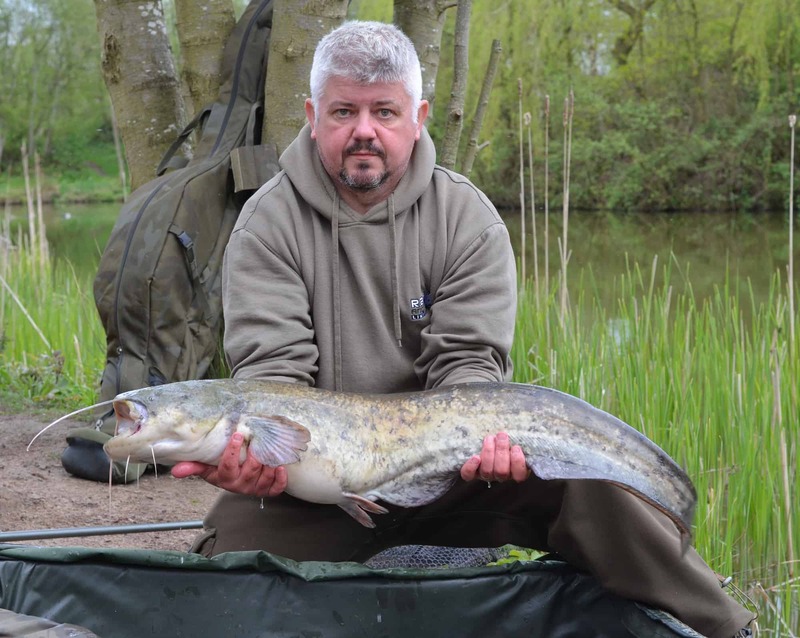 From that day on, I’ve always liked to see a catfish banked, as I think they are one of the most impressive of all UK freshwater species, and I couldn’t wait to get the rods in and try for my first of the season. 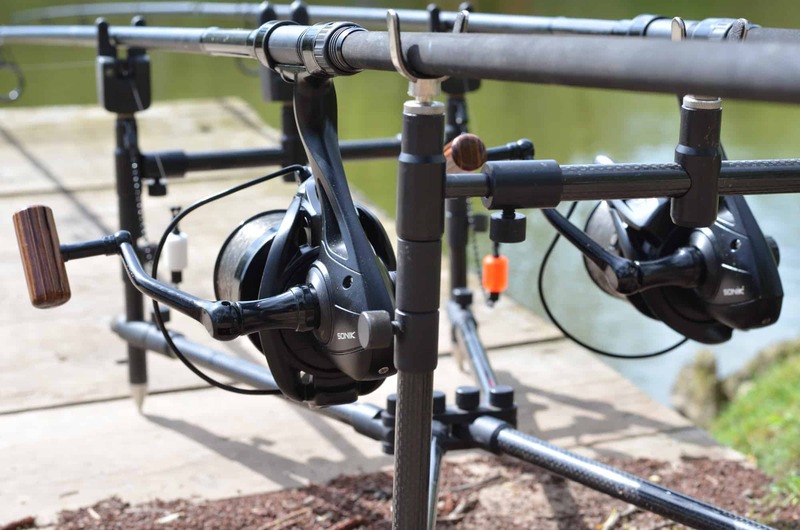 I was booked on ‘High Point’ peg, giving access to plenty of open water, and the margins of an island to my right, so quickly barrowed my kit around and watched the water to see if I could spot any fish. The lake is home to a huge head of carp in addition to the cats, but it was the moggies I really sought, though in the early morning calm, I couldn’t see anything which gave them away. 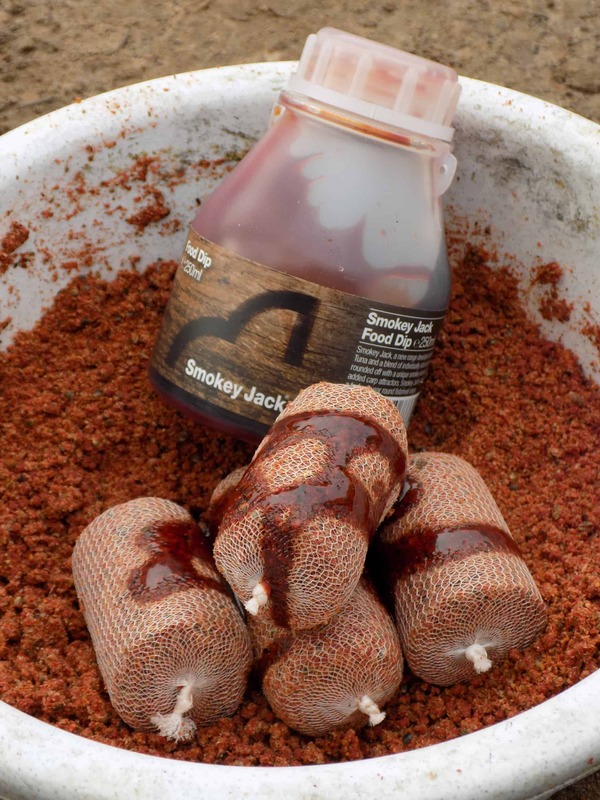 I was also keen to use the newest bait from the Spotted Fin stable, Smokey Jack. It’s a smoked tuna mix and combined with matching glug and pellets, I figured that the fishy stink might attract a customer. I mixed up a small amount of tuna stick mix, added some 20mm Smokey Jack pellets, and splashed a glug of the same food additive into lake water before combining the lot to produce a fishy feast fit for catfish! 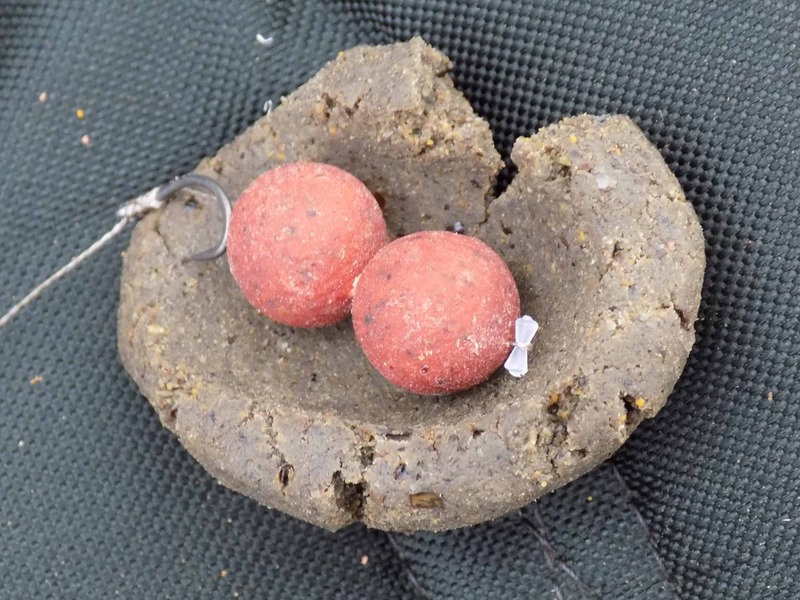 On the hook, Smokey Jack boilies wrapped in halibut paste, and on the other rod, a big lump of meat, before the hook links were pulled through a pva bag of my fishy mix, the hooks pulled into the pva to protect the points, and both were lobbed out and then surrounded with a few scattered boilies; perfect! Other anglers hadn’t caught overnight, and I noted a couple of unusual floats which turned out to be holding leeches in the upper layers ready for a strike from below. 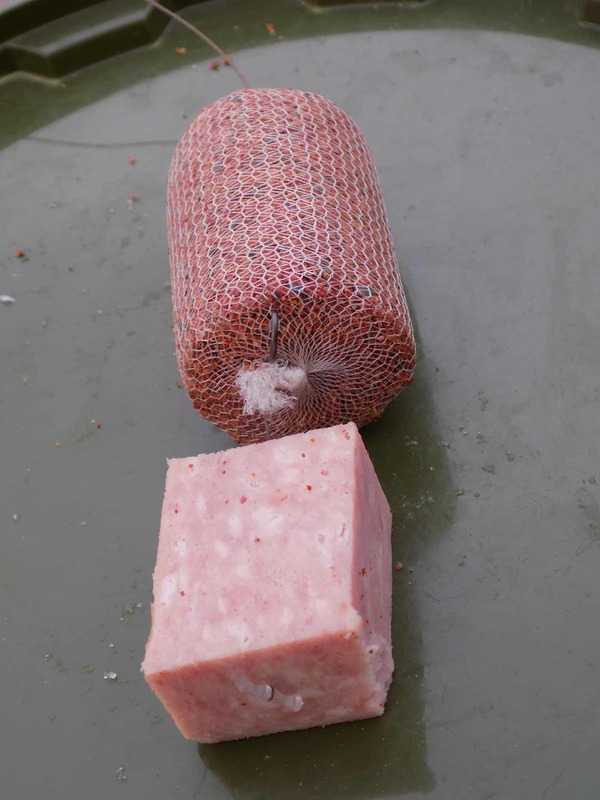 I’ve never used leeches, I’ve had them crawl up my legs in Belize, but never used them as bait, so was intrigued to find out more from the angler who was using them. I know they are probably the best catfish bait going, but I always considered them prohibitively expensive so stick to cheaper options. My compatriot explained that leeches are supplied in a bio-gel, that they are indeed hardy little suckers, and can even regenerate to be used again if you are careful, but confirmed my suspicions that at £7.50 for ten, they might not be a viable option for many anglers. With the bait recast, I sat back to wait, and enjoy my first brew of the day as the sun came up, and the lake started to come to life. It’s a well established lake, with some very friendly robins who are bold enough to sit on your knee as they await titbits, and fantastic grey herons who hunt at close quarters which are always a pleasure to see. Slam! The bobbin shot up towards the blank as something hit the boilie hook bait, and the alarm receiver went mad in my pocket! Once again, I hit the run immediately, expecting to contact something solid, but this time struck into thin air as whatever picked up the bait quickly dropped it. My rigs were very simple; a short length of leadcore (think Korda bag leaders) with a two ounce lead stripped of its inner sleeve running freely to a bead protected swivel, then a quick link, terminating in a coated braid with a few inches peeled off to aid the movement of the hook. The lead was so free running that I pinched on a pva nugget behind it to hold it in place during the cast! Despite their size, catfish can be incredibly shy biting, so I try and remove as much resistance as I can. Just ten minutes later, another screaming take also saw no result. Three runs, no fish. I didn’t think I was doing much wrong, the other anglers hadn’t had so much as a sniff of a fish either, so at least I was getting some interest, but I hadn’t connected with anything. I’d been there for about three hours at this point, and noted more activity in the swim, so remained hopeful. I remounted a pva stick on both rods and put them back out into the baited zone. The angler behind me then also missed a run, but my swim was quiet once more, and stayed that way all day aside from a couple of small lifts which I took to be bream picking up and releasing the heavy baits. Boom! An explosion of spray and mud, and the cat took off on a pounding run across the lake as I spun the clutch back in to take the strain. My rod arched over pleasingly, and I quickly made some gains before the cat began to plod from side to side in front of me as a crowd gathered. It was the only positive cat action between us, and of course, everyone wants to know exactly what is lurking in the depths, so I was praying I wouldn’t lose it! It eventually started to give up, slipping across the surface to the waiting net, but then spotted the waiting mesh, and surged off again! It wasn’t a big fish, but even a small cat usually gives an excellent account of itself, and this one was no different. A few minutes later, the cat was netted by Steve, and gently lifted to the waiting mats. I’m always struck by the beautiful mottled marbling of the catfish, no two are ever the same, and the pale grey shape laid serenely in the bottom of the cradle as I unhooked it. Quickly hoisted for a photograph, it was weighed at 17lb 12oz, (not the monster I’d hoped for, but still pleasing) and gently returned, swimming away back into the murk to cap a successful first cat foray of the year. I’m after bigger fish if I’m honest, and the venue holds them to almost 70lb, so despite catching the only fish of the day, I’ll certainly be back for more, but next week, Australia beckons, and my column will be written from there, so who knows what I’ll be catching! Tight lines!